Server 2008,server 2008 SBS and SBS 2011 do have the functionality for SSL 3.0 however by default it does not understand anything that tries to connect with this protocol. 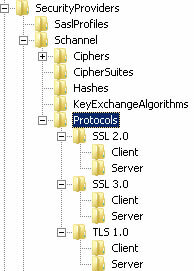 For security reasons if you need to enable SSL 3.0 on your server we can enable it with some additional registry keys. Follow the step by step guide below. • That’s all! Now you need to restart your server to apply those changes. • If you are using TMG 2010 or ISA 2006 to publish the website externally you will need to apply exactly the same settings to registry to it.